In mythology, Lord Muruga is the son-in-law of Indra. A popular figure once, folklores weaved around this handsome, muscular and virile warrior-god have resulted in his popularity waning. As a student of traditional stories, the lesson I have learnt is that our great heritage is a metaphor for real life which is complex, unlike the simple good vs bad, black vs white, right vs wrong reports that the media subjects us to. Understanding these will require us to go into the depth of the subject often missed in the reportage of most of our celebrated journalists. 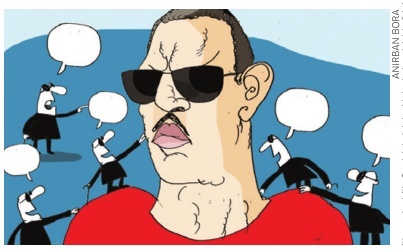 Some have christened Robert Vadra as the `Damad of India' -the son-in-law who got it all. From Prime Minister Narendra Modi to 9pm anchors, everyone has enjoyed taking a pot-shot at him, demonising the word `damad'. But how many have have thought it fit to go into the merits of the allegations they levy on Vadra? For starters, the PM, whose very public charges on Vadra were dismissed by the Election Commission, must answer why these allegations appear like `Ram-Mandir' rhetoric only during elections. It has been six months since the BJP has come to power at the Centre. And yet, no wrongdoing on the part of Robert Vadra has come to light. Should the ruling party now not admit the innuendos against Vadra were baseless? What else explains the fact that the CBI -under this government, mind you -has found no traces of any illegal benefits when a presentation was made to it by the petitioner who challenged Vadra's so-called `land deals' in the Delhi High Court. Every single as pect connected to Vadra that makes headlines was put before the chief justice. Like the Allahabad High Court and the Supreme Court earlier, it also found no merit in these accusations. Another story that grabbed front pages was the shutting down of six companies which had not paid taxes since 2011. Was it just a convenient omission that these firms were started only in 2012 and transacted no business necessitating their shut down? So where was the question of taxes in 2011? For the record, all of these `sensational discoveries' have been taken from the balance sheets uploaded by Vadra himself in the public domain. As in during the run-up to the Rajasthan elections almost a year ago, this time in Haryana just before elections, the `breaking story' of Vadra's firms applying for a Change of Land Use for a guest house grabbed headlines. Except that no Change of Land Use was ever ap plied for. Running a guest house as per the law does not require a ANIRBAN BORA Change of Land Use. Permission to run the guest house was applied two years before the state went to polls. Has anyone produced the copy of the so-called `CAG report' that says Vadra's firms owe Rs 42 crore to the Haryana government? No. Simply because no such CAG report exists. In fact, this entire CAG matter was taken up in a PIL before the Delhi High Court where it was clarified. It will be worth noting that not an inch of government land in Haryana was given to Vadra -unlike in Gujarat where friends of Modi got huge tracts of land at throwaway prices. There are several myths propa gated around Vadra. One such fa ble is how he enjoys no frisking at airports. Another misleading one is on how he derives protection from the Special Protection Group.But a quick fact-check will show Vadra does not enjoy SPG or Z security . When travelling alone, Vadra gets frisked by the security like any common citizen. The only exemption granted to him is when he travels with Sonia Gandhi, Rahul Gandhi and Priyanka, the wife and children of former PM Rajiv Gandhi. This is no different from the security privileges that would be extended to Prime Minister Modi's wife and mother, if he chooses to travel with them. His critics falsely peddle the notion that Vadra's businesses blossomed thanks to the benefaction of the UPA. But they fail to tell us that Vadra comes from a successful business family , and yet this did not stop him from creating his own venture from scratch while he was still in his 20s. Lord Muruga is also the son of Lord Shiva and is a fierce fighter himself. There are many sides to every story . Simply looking at just one aspect may not always lead to an accurate understanding of the subject.